A craft brewery was looking for a multi purpose meter to accurately measure hot water added into the mash tank as well as measure chemicals during the cleaning process. The staff was looking for a versatile meter that would be easy to install in-line, included an easy-to-read display and could be mounted in different orientations depending on piping layouts. The brewer called Assured Automation and was given the recommendation of the G2 Stainless Steel Liquid Flow Meter. This meter offered excellent fluid compatibility in the brewing process and later during cleaning.A second meter was needed before the bottling process. 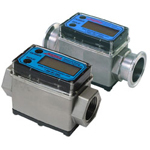 Price can be a factor when using multiple meters but the Assured Automation meters proved to be cost effective. Assured Automation’s G2 industrial grade flow meters can be easily removed, making equipment cleaning simple. The internal parts can be replaced on-site reducing down time, making maintenance simple. View Assured Automation’s other products used in brewing applications. The beer brewing industry is a huge, global business including home brewing operations, thousands of smaller producers and a handful of major companies. Customers report that using Assured Automation valves and meters improves the quality of beer by making each batch consistent. This entry was posted in Flow Meter Case Studies, Flow Meters, Food/Beverage, Latest News and tagged craft beer water meter, Digital Flow Meters, Digital Water Meters, Flow Meters, G2 Series Industrial Grade Flow Meters, water meter for beer. Bookmark the permalink.